LiFeSource AC/DC Charger Review « Big Squid RC – RC Car and Truck News, Reviews, Videos, and More! A while back I was looking into getting a LiFe battery for the office 4PK radio we have here. It seemed like a good way to start working a little more with LiFe batteries and maybe get a little more time with our transmitter between charges. (It comes with a NiMH pack). 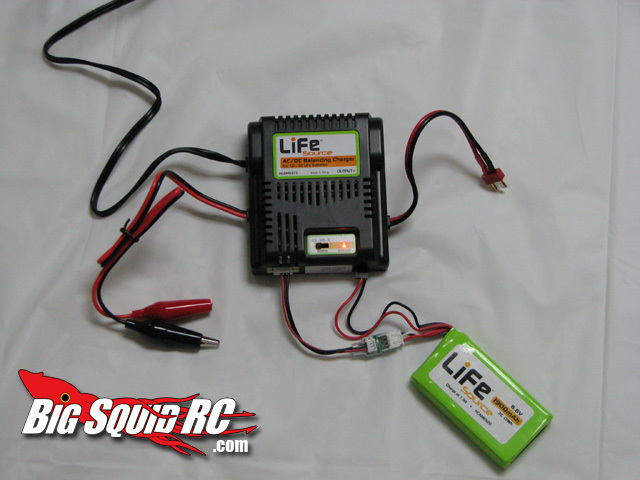 Well we need a way to charge the pack, so we thought we’d check out the LiFeSource charger as well. Read on to hear our thoughts on it..
Out of the box the charger is pretty darn simple. It’s specifically made to charge LiFe (Lithium-Iron Phosphate) batteries. It has a switch that allows you to select the amps to charge at ranging from 0.5 to 4.0 amps. Basically for 1s, 2s, or 3s battery packs. The charger can run on 110V AC (wall plug) and also has 12V DC connector (alligator clips) for charging off a battery or power supply. It has a regular output that came with a DEANS style connector, it also has a built-in socket for connecting batteries with the Futaba J (or universal receiver) connector. This was my favorite part. Whenever I need to charge, I just plug the battery right into this connector, make sure the amp switch is set, plug in the balancing port and away it goes! Oh yea, it also has a balancing port. 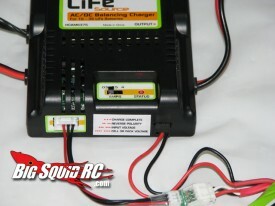 An important feature once you start to get into the world of LiFE and LiPo style batteries. So far I have been using it mostly to charge the LiFe transmitter pack for our radio, and it’s been working perfectly. The charger itself is very small, and easy to pack in and take with you. I like the fact that it works with both AC and DC if your out bashing at a location you can just plug it into a field battery if you need to charge, and the built in receiver plug socket is ideal. The cost is cheap, (I think around $35 on Tower) and if you are looking to get into the LiFe batteries, you are going to need a charger that can handle them. The only real downside to the charger, is that it only charges LiFe packs. If don’t use a lot of other types of batteries, it’s fine, or if you don’t want to spend the big $$ on a charger that does LiFe plus other battery types, this is the charger to get. Time To Bash – 9.0/10 -Very quick and easy to use out of the box. Workability – 8.0/10.0 – Only charges LiFe packs. Has adjustable amp settings. Car Show Rating – 8.0/10 – Not much to see here, very simple. Small and light a plus for on-the-go action. Bash-A-Bility – NA/10 – Hasn’t broken, but not really beating it up.